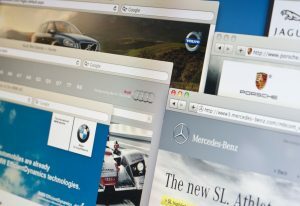 How do you compete with the best car dealer websites? How can you offer a positive user experience that leads potential customers down the buyer’s journey into a brand-new car from your lot? Here are some features you should consider adding to your dealership website in order to not only compete with the best car dealer websites out there, but be the best in the industry. Flipping back and forth between web pages or tabs can get frustrating. By letting visitors “save” cars they’re interested in and then compare them with other options, you’re building an exceptional user experience. Not only is this great for comparing vehicles, but it also lets users save their searches for later, enticing them to come back again and again until they’ve made that final purchase. Many people are going to start with the keyword search “Car.” But others will already be car experts. Give them the option to get granular with their search terms. Let people search by make, model, price, body type, engine, gearbox, MPG, and more, and you’ll easily cater to the most advanced gear-heads (which, conveniently, are those more likely to make a purchase). When you’ve already grabbed a potential customer’s attention with one vehicle, provide them some options that are similar. Similar vehicle suggestions are simple algorithms that provide other options at the bottom of the page. This will keep your visitor on a forward journey without having to click back to other searches. It’s subtle, but it makes a person feel like they’re progressing. After visitors see enough similar products, one is bound to be exactly what they’re looking for. If your dealership offers servicing, then a tool to help visitors find quotes is a must. People are a lot more web savvy these days, and they prefer an automated system to book an appointment over having to make a phone call. If they can choose all the options they want, find available dates, and get a quote at the same time—all the better! First and foremost, to compete with the best car dealer websites out there, your site should be simple, fast, and straightforward. But if you have the bandwidth to add some additional features, just like with your cars, you can sweeten the deal and attract more customers.